Service Orientation has been a buzzword for ages and has led to the fact that it is common for everyone to use the word. But that does not mean it has become easy to define and design the right service for an organization as an enterprise architect. Questions that often arise are: What are services? May they contain technical words? Are business services external or internal services provided from the IT to the business? The benefit of working with services or providing services to your customers is that you make their lives easier. Services are much more simple or less complex than products to use. So the main reason to document your current services and future services is to make the life of your customers easier, to show your added value more and to make yourself more distinctive from competitors. If you want an example, I can give one. Suppose you can buy a super deluxe coffee machine that can produce the best coffee ever. The only thing is you need to operate the machine in a certain way, or else the coffee is like sewage water. What if the suppliers of the coffee machine would offer a coffee service. Instead of you making the coffee yourself you can choose for someone making it for you on your premises. Or coffee cans with the best coffee are delivered to your house. Well, I think now you get it why services make your life easier as consumer, client or customer. ArchiMate is an enterprise modeling language to model easily across layers in an enterprise. ArchiMate recognizes three layers: business, application and technology. In these layers several common entity classes are recognized as: product, service, object, process, application, system software and node. ArchiMate has its definition of service and every architect has its own definition of service. Here I will provide the ArchiMate definition for service. And maybe before you read this, you may write down your definition of service or for certain types of services. So you can see how you comply with or differ with ArchiMate. ArchiMate defines the word 'service' on its own: A service is defined as a unit of functionality that is exposed by a system to its environment. A service hides internal operations. A service provides a certain value (monetary or otherwise). ArchiMate recognizes three types of business services, application services and infrastructure services. A business service is a coherent piece of functionality offering value to the environment. It is independent of the way functionality is realized internally. And a distinction can be made between external business services, that are offered to customers, and internal business services, that are offering supporting functionality to processes within the organization. An application service is an externally visible unit of functionality, provided by components, meaningful to the environment and exposed via interfaces. An infrastructure service is defined as an externally visible unit of functionality, provided by nodes, meaningful to the environment and exposed through interfaces. Examples provided by ArchiMate of services are: travel insurance selling, customer info processing and messaging. What is strange to me is how the definition of service contains elements that have to do with a type of implementation of the service, i.e. loosely coupled services. Infrastructure services for instances do not always have to be exposed through interfaces to be an infrastructure service. Networking, for instance, is an infrastructure service, not exposed through interfaces. Services give an opportunity to make life easier for your external customers and your internal clients or stakeholders. And it does not matter if we are talking about business services, application services or infrastructure services. It applies to all types of services. For instance, the infrastructure service of Home Computing makes the life of employees easier. Looking a bit further into your employees you might recognize the need for dealing with certain Home Computing situations like Off the Grid Home Computing or Abroad Home Computing. Suppose you live in a distant area with no phone lines (off the grid) or if you are in Europa or Australia (abroad), you still may want to do you work in your Mobile Home or on the Holiday Camp. One could say these are different service levels, but anyhow, the focus is on making life easier for customers and clients. IT services are often focused on mitigating continuity risks, increasing the performance of employees and reducing costs for the organization (which in fact also comes down to making life easier). Examples of these kinds of services within the field of IT Service Management are: Server Monitoring, Application Testing, Backup of Data, Intruder Detection Lockout, Service Desk, Follow Me Printing and Single Sign-On. All these services increase the performance of employees using the IT Infrastructure and Information Systems of the organization. With this I hope I have given you a different mindset on thinking of new services for your company. If you want to design services using ArchiMate you must definitely write design criteria and naming conventions. Else it is hardly impossible to work as a team towards a coherent set of services. Also if there is a reference model available in your industry for your type of organization, it would be strange not to reuse that knowledge (wisely). An example naming convention for service could be: A service always consist of one, two, three or four words: a noun and a verb, a link to markets or clients, and one of the words must be a unique denominator. For example Delivery Services, Food Delivery, Consumer Food Delivery, 24-hour Consumer Food Delivery and Marketing Services, B2B Marketing and Outbound B2B Marketing and Non-Stop Outbound B2B Marketing. Make sure that the boundaries of service are defined explicitly. Make sure that the services are autonomous. They work independently of each other. Look at the units in your organization that deliver or should deliver services in your organization and creates a hierarchy diagram of that. Look at the concerns the various units in your organization have and create a hierarchy diagram of concerns. Concerns are the important subjects, topics or information for an entity to use or to deal with, like pain and trauma in a Hospital or Citizens and Legislation in a Municipality. Often fitting concerns for your organization can be found when thinking of Markets and Clients, and looking at the mission, vision and strategy. Now per concern try to define a service. Group the services on common aspects and then create a service hierarchy of three layers. Draw a rectangle for your own organization and for two competitors/substitutes. Write down the mission, vision and strategy above the rectangle. Next, you place the services together with unique denominators that define you in the market in your rectangle and also do that exercise for your competitor. Now step back and look if service really defines YOU. And if it does not, change some things: recognize other services or move services around. Make sure every service is documented: unique id, author, owner, unit, concern, service level, costs and benefits. In addition to the ArchiMate implementation definition of service, think of a service as the work done for or help given to someone or something: a person, animal, organization or thing. This set of design criteria or design rules helps to know what services are that fit your organization. Although it is still you who has to do the thinking. As an enterprise architect you are a designer of total concepts, so you are fit for this job by definition. The Dragon1 open EA Method provides you with an alternative definition for service that does not focus on how to implement a service, but it is a definition that focusses on the identity and function of a service. The Dragon1 definition for service is: Doing work for someone or something or the action of helping someone or something, in order to make life easier, increasing focus on core activity for someone or something. This definition does not say how the service is implemented. This because it does not matter how it is implemented for something to be a service. It does matter if you want loosely coupled services. But loosely coupling is a concept that is apart from services. It looks like ArchiMate has tied the concept of loosely coupling (hiding and abstraction) to the concept of service, limiting the notion of what services really are. Now lets us try to define some common business services for a Hospital using the ArchiMate way of thinking (and a little bit the Dragon1 way of thinking). Now for some people these services really make their life easier. And that is just the meaning of service orientation. Here on Dragon1 you can model any ArchiMate diagram you like. And also in a unique interactive and animated way. 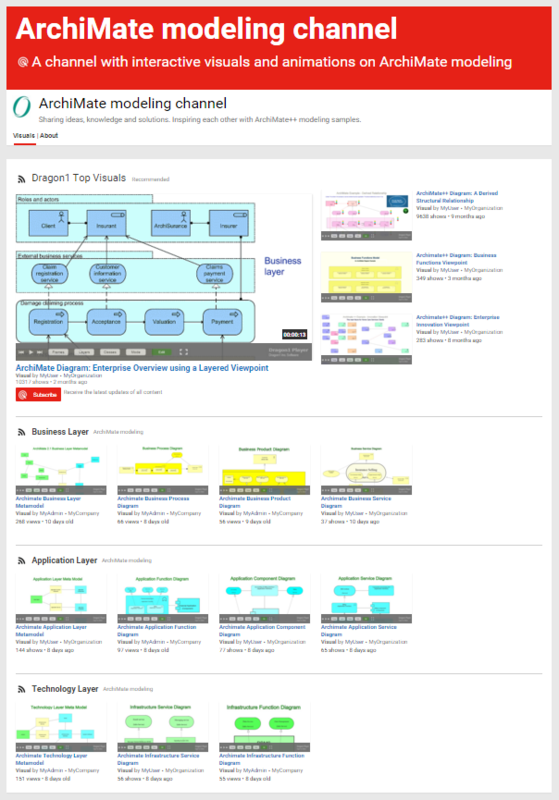 We have provided a channel for you with some ArchiMate Diagrams examples. It shows you what and how you can model ArchiMate on Dragon1. ArchiMate is an enterprise modeling language that is fit for purpose to model and visualize business services in health care. ArchiMate provides an understandable definition for services and recognizes three usable types of services. You need to put work into your design of services to make them show the uniqueness of your organization. Make use of documented design criteria to support you in defining, modeling and designing interoperable services as an individual and as a team.